The last Tube trains have left central London three hours early as a 24-hour strike takes hold. Rail, Maritime and Transport (RMT) union members began the walk-out over pay and conditions at 1830 BST and the entire network has shut down early. Commuters appeared to have followed advice to leave work early, as trains were emptier than usual. 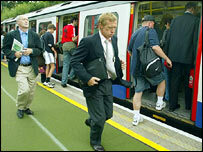 But London Underground (LU) says it does not know how many, if any, trains will run during Wednesday's rush hour. Buses, trams and the Docklands Light Railway are running as usual and river services are free until the strike ends at 1830 BST on Wednesday. London Underground (LU) says the action is "completely unacceptable". It said a revised pay offer made on Monday was "a very good offer" and would not be altered by industrial action. "We cannot agree to changes in working hours or pay that would have to be paid for by Londoners in much higher Tube fares or council tax increases," a spokesman said. On Monday, LU offered a pay rise of 3.5% over the next year and guaranteed to reduce the working week by two-and-a-half hours by 2006. But Mr Crow said "strings" attached to the proposed deal remained a sticking point and said he could not rule out further industrial action. "We send our apologies to travellers," he said. The union has voiced concerns that the reduction of hours would not apply to all Tube workers. BBC London's transport correspondent Andrew Winstanley said modernisation, rather than pay, was at the heart of the dispute. Mr Livingstone wants to use new technology, such as that used in the Oyster travelcard, which could mean ticket booth and barrier staff are moved into other roles. 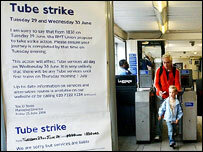 The RMT fears there could be 800 job losses and is concerned about proposals to make the Tube run later at weekends. It also wants an agreement in place that all staff will be able to go to a four-day week by 2007. But managers say it will cost too much and no agreement is likely until 2010. The RMT has about 7,500 members including drivers and signalling staff, working on the Tube. LU is expecting massive disruption - the last network-wide action, two joint RMT/Aslef strikes in September 2002, caused gridlock across London. "It seems a lot of people may have heeded advice and gone home early"